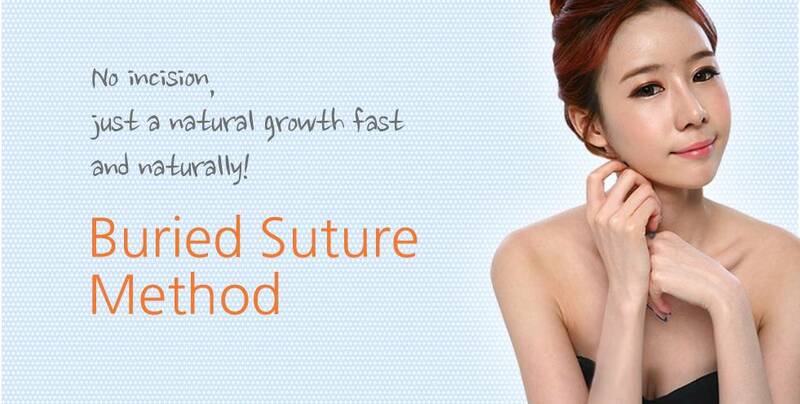 It’s non-incision types of eyelid surgery, just fixes double eyelid line. You can have natural double eyelids that others can’t realize whether you have had surgery or not. Because of its short operative time and the swelling disappeared in 2-3 days after surgery, it’s very popular for those who are working women or people limited for time. For single eyelid/ big and thin eyelid/ faint eyeliner, Buried Double Eyelid Surgery is suitable for a natural double eyelid with 3 or 4 parts correction. But, it’s not suitable for heavy fat or muscle eyes. Get a natural and clear double eyelid line with minimal incision! It has the merits of two methods for incision / buried (non-incision) best double eyelid surgery so that it leads to very good results. It was difficult to have buried surgery on eyelids which is full of thick fat in the past, but this kind of thick fat is easily removed only through a small incision of 2~3mm and buried eyelid surgery done recently. This types of eyelid surgery is a sure method with the lowest probability of double eyelid untied. It’s the most common method for making double eyelid line by removing and adjusting the skin around the eyelids, muscle, fat, connective tissue after incision along the line of the eyelid according to the desired height of the double eyelid line. TIncisional Double Eyelid Surgery method helps remove thick muscles around the eyes and adipose tissue of eyelids, makes the eyelids thin, and also has wrinkle removal effect by removing the sagging skin.